This morning, after being down with a cold for the past four days, I felt like having something a bit more wholesome and warming for breakfast. I can't think of many meals more comforting than a bowl of oatmeal and that's exactly what I needed this morning. 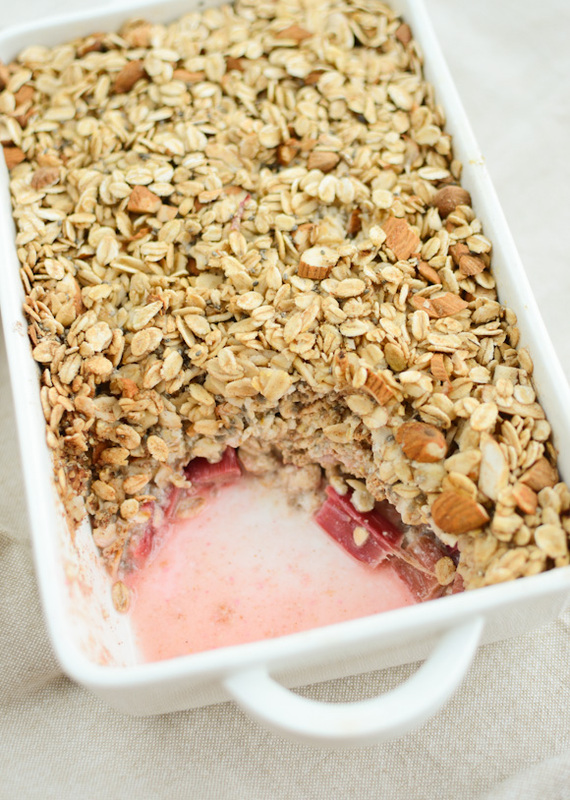 Combined with almonds, chia seeds and cinnamon and a layer of soft rhubarb on the bottom, this baked oatmeal is truly comforting, and perfect for lazy weekend mornings. 1. Preheat oven to 180C and brush a medium-sized oven dish lightly with olive oil. 2. Cover the bottom of the dish with rhubarb pieces. 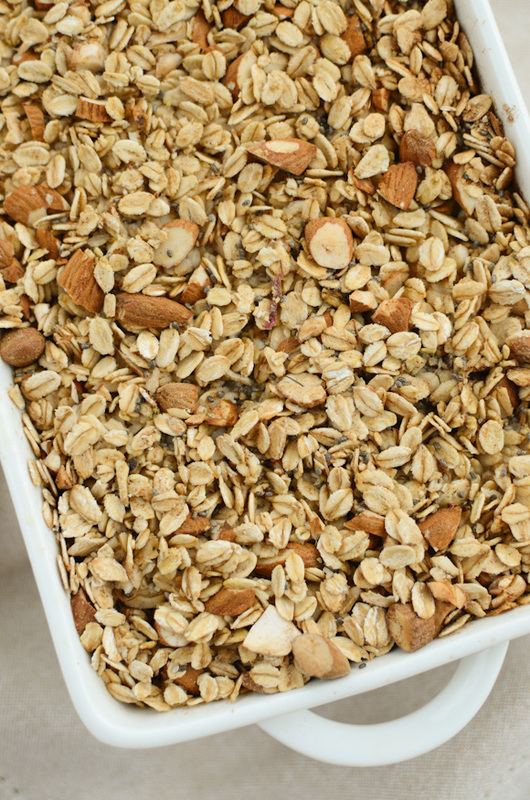 Combine the oats, almond, chia seeds, cinnamon and salt in a separate bowl. Pour the mixture on top of the rhubarbs and finally pour the almond milk (evenly) on top. 3. Bake for 30 minutes. Serve warm. Absolutely gorgeous! What a lovely treat. 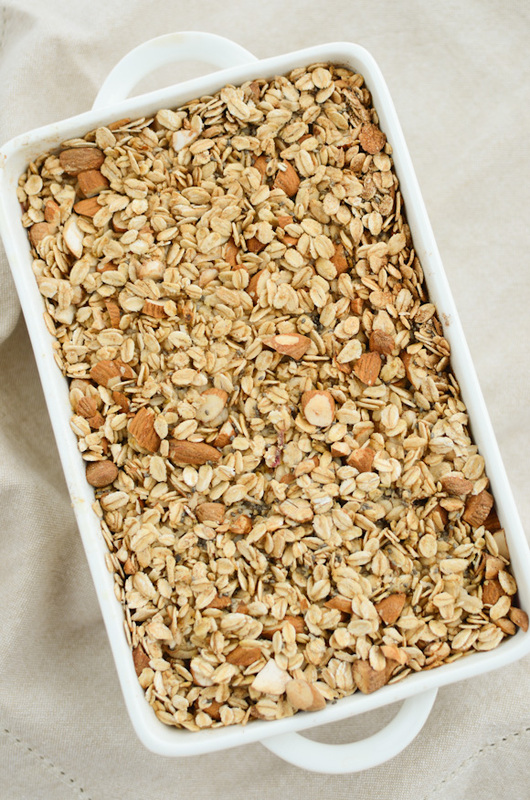 Baked oatmeal is such a comforting breakfast. I look forward to fresh rhubarb, but in the meantime I'll have mine with frozen berries. Feel better! this looks so delicious maria! I'm sorry you were ill. I love rhubarb and will make this the second it comes into season here in the States. I just made a wonderful Cran-Apple Millet breakfast bake that I posted today. I have been wanting to incorporate chia seeds into our diet so I'm doubley excited to find this recipe! I really like the addition of almonds and almont milk to sweeten up the naturally tart rhubarb without adding any sugar. Blueberries would have probably worked well too. Yum. PS hope you're feeling better. Oooh! It's like breakfast crumble! I wonder if there's a way of baking it overnight - maybe I'll set up a timer so that it comes on 30 minutes before I wake up!